Authors: Amin, M. N., Solayman, H. M., Snigdha, S. S. and Sultana, J.
Abstract: This study identifies the prospect of climate resilient alternative livelihood activities to reduce the effect of climate change. For this study five focus group discussion (FGD) and 120 questionnaire surveys were conducted and interpreted. Results show that housework and fishing are the most important income generating sectors in Sreepur, Char phenua, Char mahisha, Elisha koralia under Mehendiganj upazilla of Barisal district. Perceived impact of natural disasters on livelihood activities was calculated as more than medium high effect, i.e., 3.1 in a scale of 5. Perceived resiliency of the livelihood is 36% for the traditional livelihood and the income loss due to the lack of climate resiliency of the livelihood estimates as 26000 BDT year-1person-1. Perceived livelihood loss due to the natural disaster was estimated at about 50000 BDT year1 person-1. This study specifies the prospect of climate resilient alternative livelihood activities by measuring the perceived fiscal value of the livelihood loss due to lack of climate resiliency and loss due to natural disasters in the studied areas. Amin, M. N., Solayman, H. M., Snigdha, S. S. and Sultana, J. (2018). Climate resilient livelihood activity in the south central coastal region of Bangladesh. Journal of Science, Technology and Environment Informatics, 06(01), 421-430. Amin, M. N., Solayman, H. M., Snigdha, S. S. and Sultana, J. “Climate resilient livelihood activity in the south central coastal region of Bangladesh.” Journal of Science, Technology and Environment Informatics, 06.01 (2018): 421-430. Amin, M. N., Solayman, H. M., Snigdha, S. S. and Sultana, J. Climate resilient livelihood activity in the south central coastal region of Bangladesh. Journal of Science, Technology and Environment Informatics, 06, no. 01 (2018): 421-430. Authors: Hossain, K. M. D. Roy, B. Mohanta S. C. and Mia, M. R.
The study was conducted to observe the present management practices of organic waste to produce organic fertilizer and the ultimate outcomes to improve the socioeconomic condition and the agricultural production of Niamotpur, Kaligang Upazila, Jhenaidah. From the study 70% respondents are producing vermicompost from organic waste. It takes about 40-45 days to convert vermicompost from organic waste and is an easy process to convert and manage the biodegradable organic waste. The vermicompost use intensity in the study area is high due to the hazardous impact and high price of chemical fertilizer whereas the vermicompost is really low in price and free from all hazardous impact. Vermicompost can be used for all kinds of crops. By applying this technology, the village people had changed their total socio economic conditions than the past. Farmers in this area are greatly benefited through vermicomposting. Before vermicomposting, unmanaged waste caused serious environmental problems and they suffer from various disease but their environment conditions is better now. Vermicomposting is compatible with sound environmental concepts that value sound conservation of resources and sustainable practices. Hossain, K. M. D. Roy, B. Mohanta S. C. & Mia, M. R. (2018). Adoption of Vermicomposting for Sustainable Solid Waste Management and Agricultural Production. Journal of Science, Technology and Environment Informatics, 06(01), 431-442. Hossain, K. M. D. Roy, B. Mohanta S. C. and Mia, M. R. “Adoption of Vermicomposting for Sustainable Solid Waste Management and Agricultural Production”. Journal of Science, Technology and Environment Informatics, 06.01 (2018): 431-442. Hossain, K. M. D. Roy, B. Mohanta S. C. and Mia, M. R. “Adoption of Vermicomposting for Sustainable Solid Waste Management and Agricultural Production”. Journal of Science, Technology and Environment Informatics, 06, no. 01 (2018): 431-442. ​The study of air pollutants SO2, NO2 and PM10 in lower Onitsha basin, a densely populated city was performed using GPS and Matlab modeling. The pollutants were studied in nine specific locations for 3 months of rains over 3 consecutive years with each georeferenced. The Matlab pollution model was generated by integrating the spatial database and measured pollution attributes database using a polynomial expression. SO2 highest concentration (141 µg/m3) peaked in Upper Iweka at sampling point 1 before dispersing to lower concentrated regions in Awada and Resthouse. NO2 peaked at 207 µg/m3 in Upper Iweka at sampling point 3 and driven by wind towards Borromeo area to very low concentration of 38 ug/m3. The PM10 peaked in Upper Iweka (180 µg/m3) and driven by rains towards Borromeo before increasing again in concentration levels at Awada. The AQI showed that SO2 pollutants had acceptable air quality at all sampling points while NO2 and PM10 air quality affected sensitive groups. SO2 concentration levels exceeded the National air quality standard in Nigeria (NAQS) while NO2 and PM10 were below the NAQS standard. The GIS plot showed that 3 metrological forces were driving pollutants from Upper Iweka and Awada to other sampling areas in the order of SO2> NO2> PM10. The Matlab wind speed plot showed that there was an upward wind in upper Iweka driving the pollutants towards dispersal at some other region. Thus, Upper Iweka is an active point source pollution area and dispersed to Borromeo and Awada by scavenging rains under prevailing wind speed, wind direction and humidity. Hence calls for improved monitoring and regulation to address pollution. Anyika et al. “GIS and MATLAB modeling of criteria pollutants: a study of lower Onitsha basin during rains”. Journal of Science, Technology and Environment Informatics 06(01) (2018): 443-457. Anyika, L. C. Alisa, C. O. Nkwoada, A. U. Opara, A. I. Ejike, E. N. and Onuoha, G. N. (2018). GIS and MATLAB modeling of criteria pollutants: a study of lower Onitsha basin during rains. Journal of Science, Technology and Environment Informatics, 06(01), 443-457. Anyika, L. C. Alisa, C. O. Nkwoada, A. U. Opara, A. I. Ejike, E. N. and Onuoha, G. N. “GIS and MATLAB modeling of criteria pollutants: a study of lower Onitsha basin during rains.” Journal of Science, Technology and Environment Informatics 06(01) (2018): 443-457. Anyika, L. C. Alisa, C. O. Nkwoada, A. U. Opara, A. I. Ejike, E. N. and Onuoha, G. N. 2018. GIS and MATLAB modeling of criteria pollutants: a study of lower Onitsha basin during rains. Journal of Science, Technology and Environment Informatics, 06(01), pp. 443-457. Anyika, LC, Alisa, CO, Nkwoada, AU, Opara, AI, Ejike, EN and Onuoha, GN. GIS and MATLAB modeling of criteria pollutants: a study of lower Onitsha basin during rains. 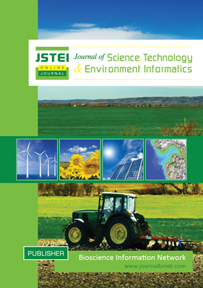 Journal of Science, Technology and Environment Informatics. 2018 October 06(01): 443-457. This study was conducted to compare the energy productivity of rainfed and irrigated sorghum in Sudan. Input data and yield were collected from the Agricultural Directorate records and The Mechanized rain farming Directorate. Results showed that total energy inputs of rainfed and irrigated sorghum were 1876.32 and 16469.35 MJ/ha, respectively. The total energy outputs were 108820 and 142000 MJ/ha, respectively. Based on these results, the energy use efficiency for rainfed and irrigated sorghum were 58.0 and 8.62, respectively. The energy productivity were 0.32 and 0.17 for rainfed and irrigated sorghum, respectively. The share of renewable energy of rainfed and irrigated sorghum were 15.20% for rainfed and 3.05% of the total input energy. Therefore, rainfed sorghum production is more efficient than irrigated sorghum. The study revealed that although the total energy output is high, only about 8% of it is grain and the rest is straw energy. Elfadil, A. D. “Energy use pattern for rainfed and irrigated sorghum production in the Sudan”. Journal of Science, Technology and Environment Informatics 06(01) (2018): 458-465. Elfadil, A. D. (2018). Energy use pattern for rainfed and irrigated sorghum production in the Sudan. Journal of Science, Technology and Environment Informatics, 06(01), 458-465. Elfadil, A. D. “Energy use pattern for rainfed and irrigated sorghum production in the Sudan” Journal of Science, Technology and Environment Informatics 06 (01) (2018): 458-465. Elfadil, A. D. 2018. Energy use pattern for rainfed and irrigated sorghum production in the Sudan. Journal of Science, Technology and Environment Informatics, 06(01), pp. 458-465. Elfadil, A. D. Energy use pattern for rainfed and irrigated sorghum production in the Sudan. Journal of Science, Technology and Environment Informatics. 2018 November 06(01): 458-465. The effect and magnitude of river bank erosion are multiple because of its polygonal impact. It creates a great loss of physical and natural resources which makes the life of people more vulnerable. This study was an initiative to explore the effects of riverbank erosion on living and livelihood of rural people of Nolian village of Dacope Upazila, Khulna, Bangladesh. The current study applied survey method because the household heads were considered as the respondents. Applying face-to-face interview method author collected data through an interview schedule form 336 household head. Findings revealed that 94% of respondents were affected by river bank erosion up to 9 times during their lifetimes. The inferential statistics describes that after riverbank erosion income of the household declined, in addition, their expenditure decreased. (42.0%) strongly agreed that food cost and medical cost due to riverbank tremendously increased. Majority (32.70%) household lost more than (1 to 3) metric tons of rice, and another (29.20%) lost (4 to 6) metric tons of rice. This study also explored that (36%) people and households lost (1-5) bighas of land, while (35%) household lost (6-10) bighas of land and the rest 59(10.5%) household lost (above-10) bighas of plough lands and homestead. The river bank erosion problem is increasing in Bangladesh due to lack of proper initiatives. The prevalence of river bank erosion dares to question the initiatives which had already been taken and implemented in different times in Bangladesh. Adequate measures need to be taken for stopping this situation while this study would assist the interested researchers for taking further extensive researches on this issue. Khan, B. et al. ''The effect of riverbank erosion on lives and livelihoods of rural people: a study on Nolian village, Khulna, Bangladesh”. Journal of Science, Technology and Environment Informatics, 06(01)(2018): 466-473. Khan, B., Nabia, S. A. and Rahman, M. A. (2018). The effect of riverbank erosion on lives and livelihoods of rural people: a study on Nolian village, Khulna, Bangladesh. Journal of Science, Technology and Environment Informatics, 06(01), 466-473. Khan, B., Nabia, S. A. and Rahman, M. A. The effect of riverbank erosion on lives and livelihoods of rural people: a study on Nolian village, Khulna, Bangladesh. Journal of Science, Technology and Environment Informatics 06(01) (2018): 466-473. Khan, B., Nabia, S. A. and Rahman, M. A. 2018. The effect of riverbank erosion on lives and livelihoods of rural people: a study on Nolian village, Khulna, Bangladesh. Journal of Science, Technology and Environment Informatics, 06(01), pp. 466-473. Khan, B, Nabia, SA and Rahman, MA. The effect of riverbank erosion on lives and livelihoods of rural people: a study on Nolian village, Khulna, Bangladesh. Journal of Science, Technology and Environment Informatics. 2018 December 06(01): 466-473. Authors: Hossain, M. A., Zahid, A. M., Arifunnahar, M. and Siddique M. N. A. A total of one hundred and twenty-one brick kilns have been surveyed to assess the effects of brick kiln in land degradation and environmental pollution. Brick kiln owners and or surrounding farmers of the associated brick kilns has been interviewed through a pre-structured questionnaire. The survey area covered eighty-six Upazila’s (sub-districts) under forty-eight districts throughout Bangladesh. Most of the brick kilns are using coal as fuel. Forest woods were used in 18% of the brick kilns. Surveyed brick kilns are situated within 3-20 km from the Upazila Headquarters (HQs) and 2m-2km from the nearest homesteads. The average distance between brick kilns and nearest homesteads is about ½ km (570 m) and the same between brick kilns and Upazila HQs is about 7.36km. About 58% (69 of 121) brick kilns were found approved by the competent authority but 18% (21 of 121) had no approval. 21% brick kiln owners did not disclose government approval status; which is unethical and violation of Brick Making and Establishment of Kilns (Control) Law 2013. Nearby farmers reported adverse effect of brick kilns on homestead plantation and field crops. They also reported that bearing of fruit trees is hampered; immature fruits are damaged, less fruiting in vegetables. Capacity of the surveyed brick kilns was found ranged from 0.45 million to as high as 0.78 million bricks per year. The average capacity was 2.89 million bricks per year and the total production per annum were 31.70 million bricks. Bangladesh produces 50 billion bricks per year. Use of quality topsoil of agricultural land as raw material for bricks is a substantial environmental and economic concern as evidenced from results of brick kiln survey. The government decided to prohibit previously profitable brick exports to neighboring country India as per law of the lands, which was a competent decision. Mostly fertile topsoil of agricultural land is exploited for making bricks. On an average 3 kilogram soil is required to make a brick. 150 billion kg soil is required to produce 50 billion bricks per annum in Bangladesh. One-hectare land up to furrow slice, i.e. 0-10 cm contains 2X106 kg of soil. Bangladesh cannot afford losing huge amount fertile topsoil every year. This would certainly lead food insecurity and vulnerable livelihood, apart from arable lands degradation and environmental deterioration of the country. Hossain et al. “Effect of brick kiln on arable land degradation, environmental pollution and consequences on livelihood, Bangladesh.” Journal of Science, Technology and Environment Informatics 06(02) (2019): 474-488. Hossain, M. A., Zahid, A. M., Arifunnahar, M. and Siddique, M. N. A. (2019). Effect of brick kiln on arable land degradation, environmental pollution and consequences on livelihood of Bangladesh. Journal of Science, Technology and Environment Informatics, 06(02), 474-488. Hossain, M. A., Zahid, A. M., Arifunnahar, M. and Siddique, M. N. A. “Effect of brick kiln on arable land degradation, environmental pollution and consequences on livelihood of Bangladesh.” Journal of Science, Technology and Environment Informatics 06(02) (2019): 474-488. Hossain, M. A., Zahid, A. M., Arifunnahar, M. and Siddique, M. N. A. 2019. Effect of brick kiln on arable land degradation, environmental pollution and consequence on livelihood of Bangladesh. Journal of Science, Technology and Environment Informatics, 06(02), pp. 474-488. Hossain, MA, Zahid, AM, Arifunnahar, M, Siddique, MNA. Effect of brick kiln on arable land degradation, environmental pollution and consequences on livelihood of Bangladesh. Journal of Science, Technology and Environment Informatics. 2019 March 06(02): 474-488.